Roy Nissany (Lotus) cruised to his first Formula V8 3.5 win today at Silverstone. After putting together a dominating performance in practice, the Israeli racer was off to a stunning start from the second, storming back to second place. 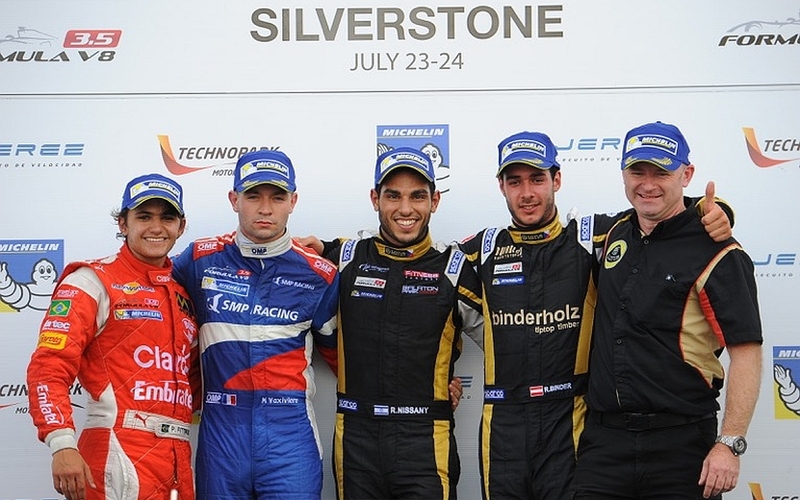 Nissany eventually fought his way to victory despite a contact with Egor Orudzhev (Arden Motorsport) that sent both of them out spinning at the Stowe corner. Matthieu Vaxiviere (SMP Racing) and René Binder, on the second Lotus car, completed the podium. At the start, an extra formation lap was given to help recovering the car of Louis Delétraz (Fortec Motorsports) stranded on the grid. As a consequence, the race was shortened by two minutes with Egor Orudzhev taking an early lead and Roy Nissany in close pursuit. On the other hand, pole sitter Matthieu Vaxiviere lost two positions. Rounding out the top-10 on lap 1, Tom Dillmann (AVF) led Aurélien Panis (Arden Motorsport), René Binder, Pietro Fittipaldi (Fortec Motorsports), Yu Kanamaru (Teo Martin Motorsport), Vitor Baptista (RP Motorsport) and Alfonso Celis Jr (AVF). On lap 2, René Binder took fifth place away from Aurélien Panis. On lap 3, Tom Dillmann started to pressure Matthieu Vaxiviere but also had to watch out for the recovering Binder, who eventually got by on lap 5. While Alfonso Celis Jr had to come back to the pits, Roy Nissany tried to dive on Egor Orudzhev for the first time on lap 8. The Russian held the point, while Louis Delétraz continued in a bold recovery up to 10th place. Alfono Celis Jr. made his way back on-track on lap 11 but lost his engine cover on the front straight. Race control showed him the black and orange flag two laps later which led him back to the pits to retire. On lap 15, a contact between Roy Nissany and Egor Orudzhev at Stowe sent both drivers off spinning, wiping away the 10-second margin they had built. The Israeli racer barely held onto the lead in front of Matthieu Vaxiviere, René Binder, Tom Dillmann, Aurélein Panis and Pietro Fittipaldi, while Egor Orudzhev retired on lap 17 following to a confrontation with Dillmann in turn 11. In the end, Roy Nissany was able to grab his maiden Formula V8 3.5 win. So far this season, he also scored one pole position and the three podium finishes. In sixth overall, Pietro Fittipaldi (Fortec Motorsports) brought home the rookie victory. As they were busy in a clashing commitment, Matevos Isaakyan (SMP Racing) and Artur Janosz (RP Motorsport) were absent and will be back for the next round at Red Bull Ring, on the next 11th of September. “I think some people were on their feet for me. Scoring my maiden victory is a great feeling but it was a tough race. My start was pretty normal, I was chasing Egor (Orudzhev) for a few laps. The incident is something I didn’t expect so much, he was pushing me off the track. Luckily we had a big gap and I kept the lead. The car was a bit damaged. The brakes were not in place, the balance was changing and the steering wheel as well. But it was a great feeling to cross the finish line in the lead”.